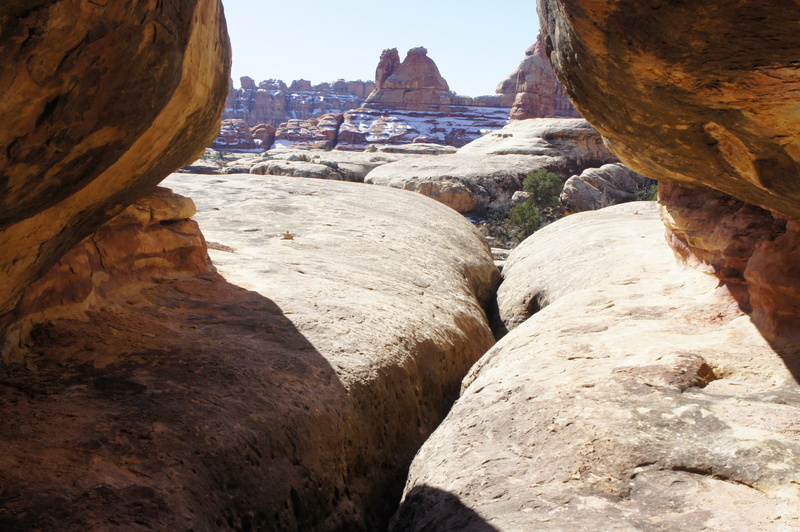 One of the principal advantages of hiking in Canyonlands National Park’s Needles District is the abundance of loop hikes. 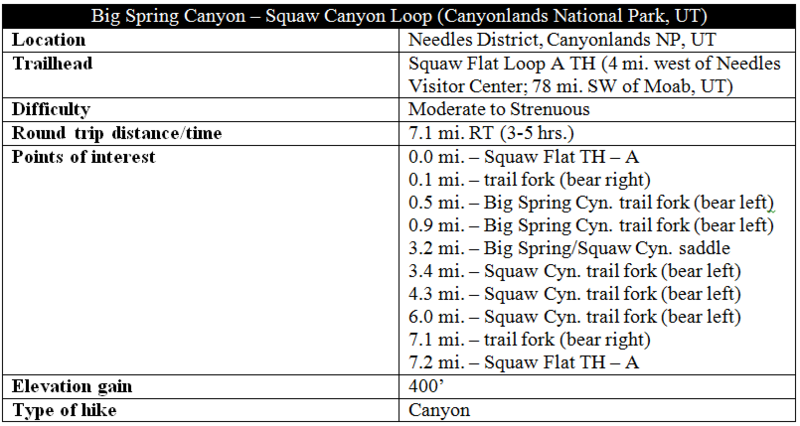 At 7.2 miles, the moderately strenuous Big Spring Canyon to Squaw Canyon loop is one of the shortest. While arguably not the most scintillating hike in the Needles (that distinction belongs to the jaw-dropping Chesler Park loop), the Big Spring-Squaw Canyon circuit (also known as the “Squaw Flat Loop”) is a fine choice for visitors looking for a half-day hike. 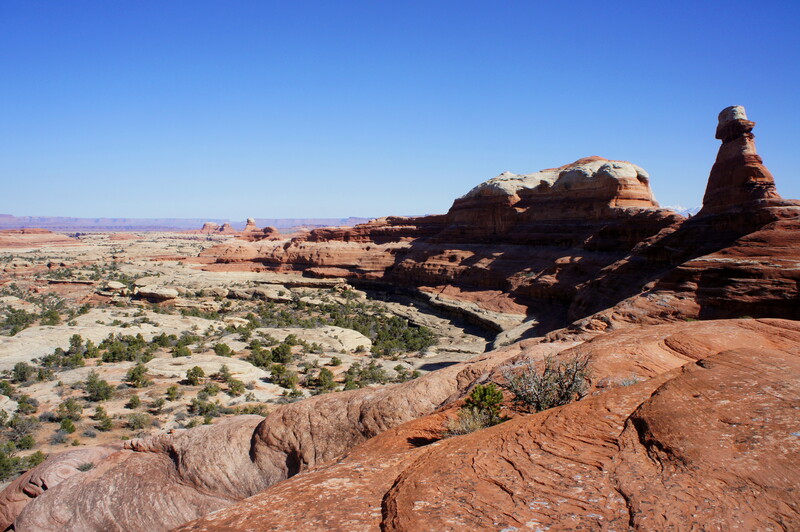 The highlight is a panoramic view from a high saddle connecting the two drainages. Overnighters in Loop A of the Squaw Flat Campground need only cross to the south side of the street to access the Squaw Flat Trailhead. Others, however, are able to park at the trailhead, located about ¾ of the way up the Loop A drive on the left. 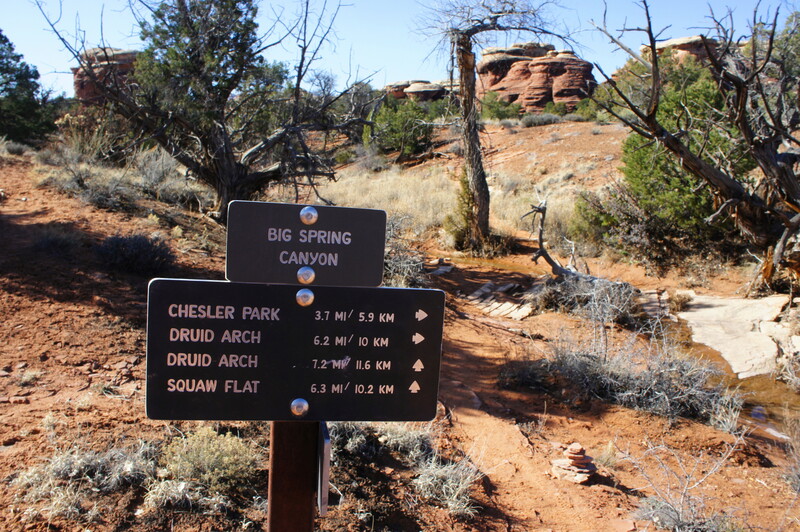 In addition to Big Spring and Squaw Canyons, the trailhead offers access to Lost Canyon and the Peekaboo Trail. Less than a minute’s walk from the trailhead, the well-worn track leaving the parking area splits into two. 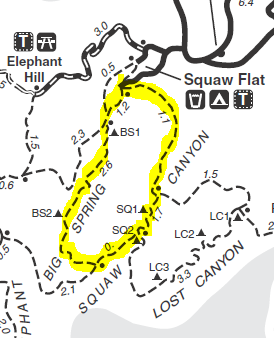 Here hikers face a choice: bear right toward Big Spring Canyon or turn left to tackle Squaw Canyon first. In terms of elevation gain, the two options are relatively comparable. 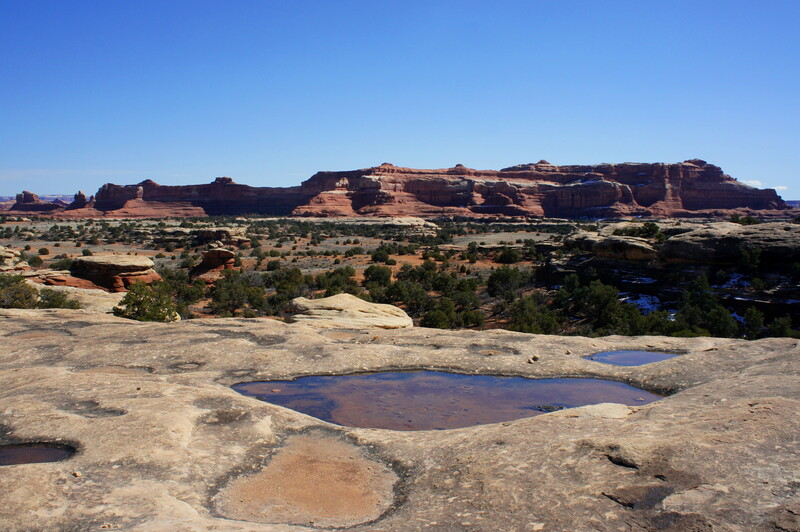 Looking ahead to the high saddle, however, hiking in a clockwise direction—up Big Spring, then down Squaw—lessens the time spent climbing pitched slickrock. Bearing right at the junction (toward Big Spring Canyon), the sandy trail edges the western flank of Squaw Flat, an open, level expanse dotted with sagebrush. After 1/10 mile, the route cuts abruptly right, climbs up to a slickrock bench, then parallels the flat bearing southwest. 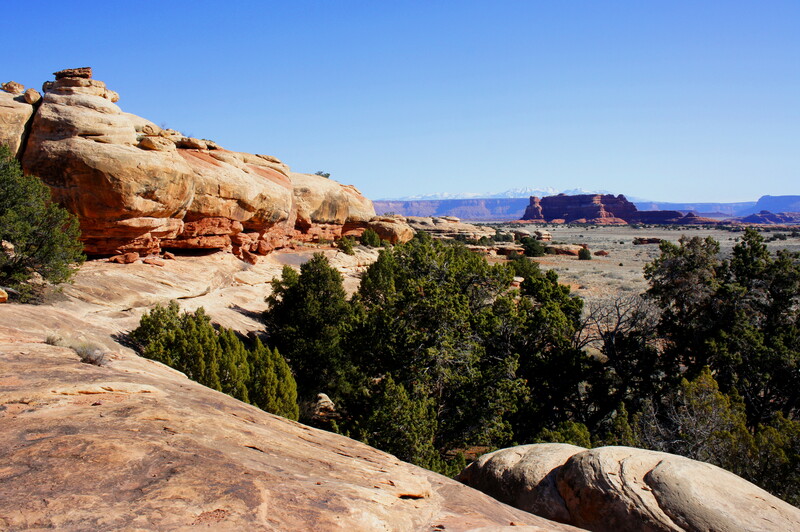 Looking back to the northeast, the ridge offers splendid views of Squaw Butte and the spear-tipped La Sal Mountains in the distance. Like most rock exposed in the Needles District, the bulging ridge crossed here is composed primarily of whitish Cedar Mesa sandstone, a relatively durable substance that interfingers with red arkose of the older Cutler Formation to form multicolor knobs, mushrooms, horsts, and “needles.” Cracks, or “joints,” in the sandstone—like the tunnel-like passage encountered shortly up the first ridge—are attributed in part to the presence of ancient salt nestled deep in the bedrock. As salt slowly flows through underground channels, it has dredged cross-cutting fractures in the overlaying sedimentary strata. Traversing the first low ridgeline requires decent route-finding skills (i.e., spotting rock cairns), as well as close attention to where you step. Upon cresting the ridge, Big Spring Canyon—at this point relatively wide and shallow—comes into view. Well-placed logs assist with the subsequent descent to the canyon floor. Stay left at the hike’s second trail junction (heading right returns one to the Squaw Flat Campground). From here the trail bears southwest across relatively level terrain to a third trail fork. A trickling creek lies just beyond. Bear left to head up-canyon, where the trail will cross this creek bottom on at least seven occasions. The water supports a variety of plant life, including riparian grasses, cottonwoods, Coyote willows, and the usual junipers and pinyon pines…which seem to grow taller than average here. 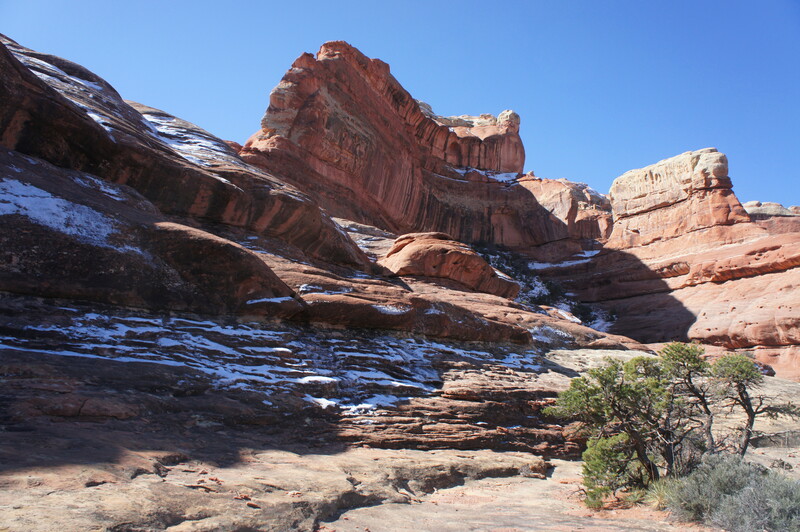 After three stream crossings—and perhaps ¾ mile of hiking from the latest junction—the canyon completes an S-curve, and the trail climbs sharply to a slickrock bench on the left. As the trail flirts with a minor undercut streaked with desert varnish, a line of tall, spiny needles comes into view to the southwest. After descending back to creek level, the footpath again crosses the stream, this time twice in quick succession, then eventually settles for the left (east) side. Roughly 1.75 miles from the last junction, the trail skirts the edge of the creek bed and veers off south, following what appears to be a significant side drainage. After hiking straight up the rocky wash for about 1/10 mile, the cairned route climbs up the left-hand bank. Roughly halfway from the mouth of the south-bending side canyon to the top of the saddle, an ovular bowl with a ledgey pouroff presents a modest obstacle. After recent rains or snowmelt, the bypass scramble to the left, around the dryfall, can be dangerously slippery—be extremely cautious. A few minutes later, a second pouroff is bypassed on the right; this time, the climb is assisted by the presence of Moki steps carved in the sandstone. From this point on, the ascent to the saddle comprises nearly all slickrock, at first smooth and level, then steep and ledgey. Atop a sandstone shelf, the cairned route bears right over to the base of a bulging spine. After a brief friction climb, the route weaves left, then right, into a narrow notch. The climb from the notch up to the crest of the pass is strenuous and may require the use of hands for assistance. Looking back north from atop the saddle, Big Spring Canyon—fringed on both sides by multicolor buttes—unfolds, while turning around provides the hike’s first look at Squaw Canyon. Squaw is both deeper and wider than Big Spring and boasts a considerable number of side canyons. The descent into Squaw begins with a sharp friction climb that should not be attempted when wet. Following cairns, hikers bear west across sloping slickrock, situated under a 400-foot outcrop with varnished walls. A first notch passed on the left is too steep to descend safely; a second gully just to the south provides a more viable alternative. Slickrock briefly gives way to sand as the route descends to a vegetated flat, where a signed junction points hikers in the right direction. 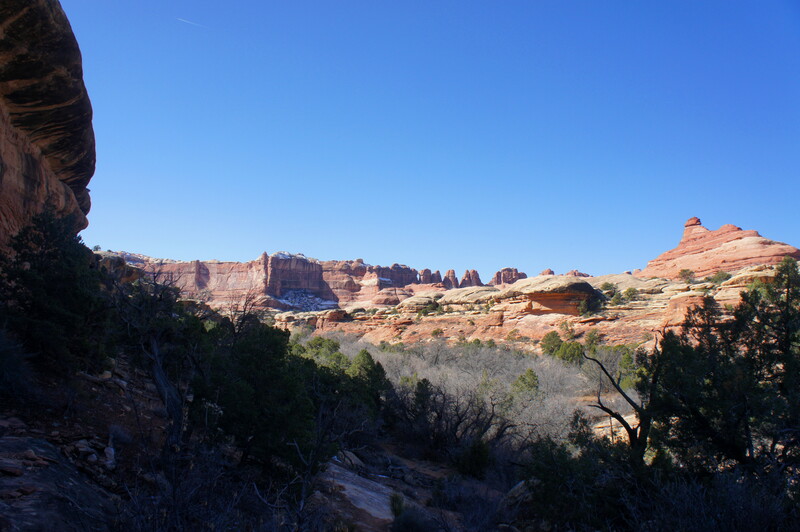 A right turn leads, eventually, to nearby Elephant Canyon, while a left continues the descent into Squaw Canyon. Near vertical sandstone pitches, however, prevent a quick and easy plunge to the bottom of Squaw Canyon. Instead, the trail must first hug a shelf along the canyon’s northern wall, traverse a deep, dark slot, then contour around a prominent tributary drainage. Finally, about 4/10 mile from the saddle, the route settles on a minor draw that provides access to the canyon bottom. The descent is short but quite steep. 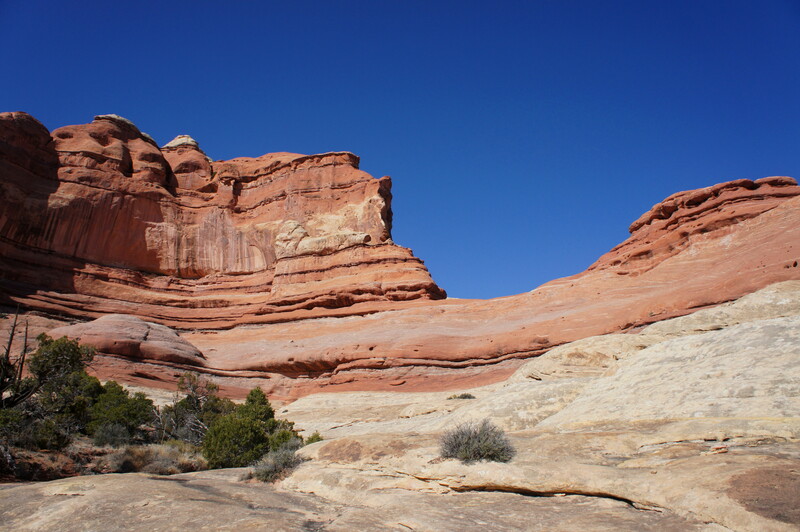 Before dropping into the main canyon, enjoy splendid views of red Wingate sandstone cliffs to the east, as well as the iconic solitary pillar of North Six Shooter Peak. 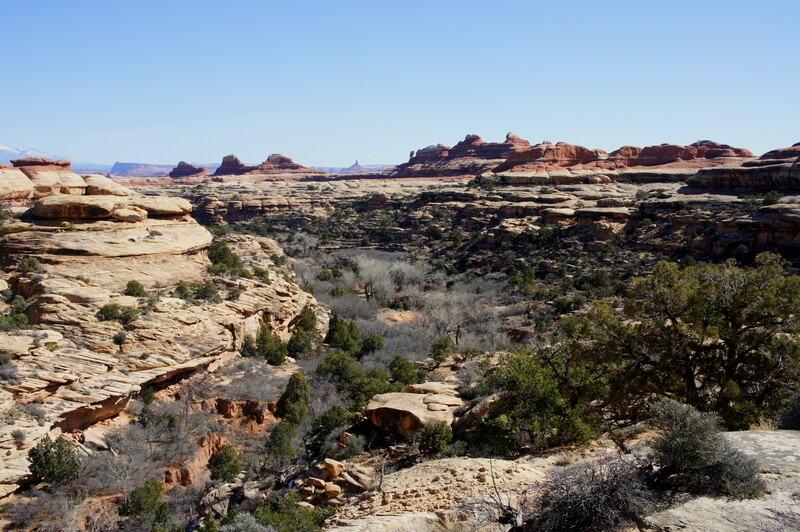 The first thing hikers are likely to notice upon reaching Squaw Canyon is the relative abundance of vegetation, which includes willows, big sagebrush, reed grasses, and cottonwood trees. On both flanks, mushroom-shaped knobs rise high above the foliage in the northeast-bearing canyon. Within ½ mile of reaching the main drainage, the trail forks for a fifth time. Stay left. 1/10 mile later, the trail traverses the streambed (which often holds water), the first of more than a dozen crossings in Squaw Canyon. After the fifth crossing, a significant side drainage enters from the right, and the main drainage bends sharply to the left. Following two additional left-curving bends, an unmarked spur trail bears off to the left to a designated backcountry campsite (SQ1), while the main track is found across the creek on the right bank. 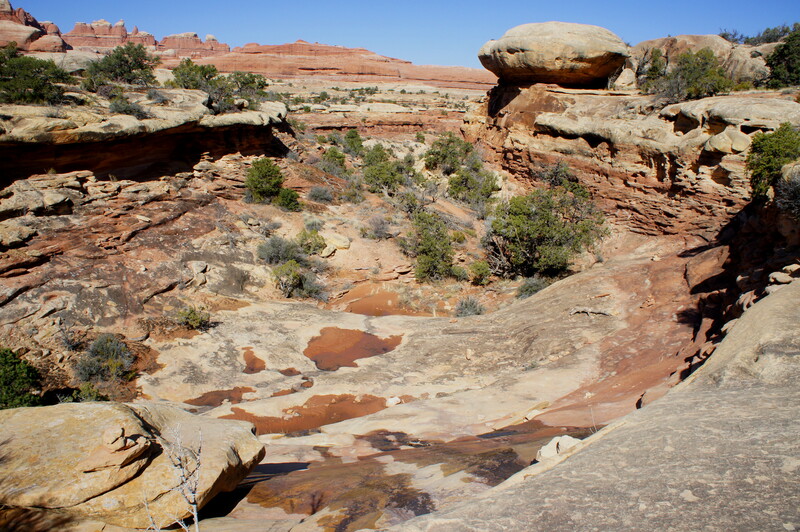 Shortly thereafter, Squaw Canyon widens significantly, and the well-worn footpath leaves the creek bed and ascends to a sandy plain on the right. Eventually the route drops back to stream level at a sixth trail junction—bear left (toward Squaw Flat Campground) to tackle the loop’s remaining 1.2 miles. 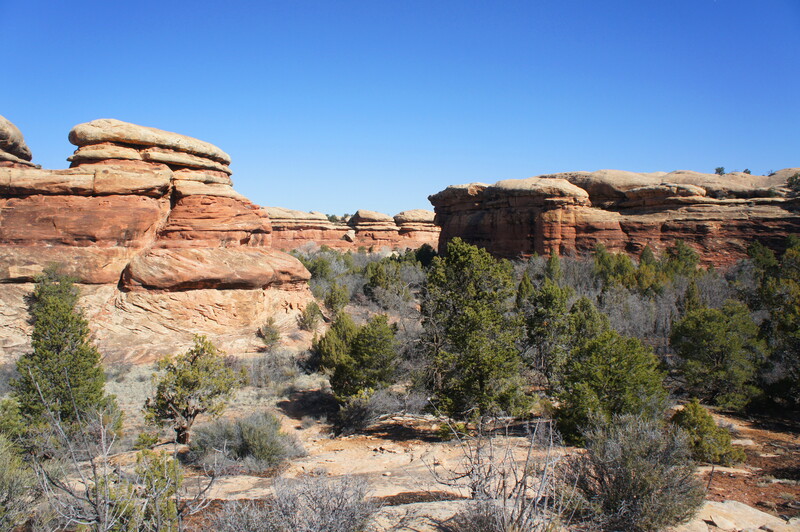 This final leg comprises three easy strolls across sandy sagebrush flats, interrupted by two slickrock saddles. 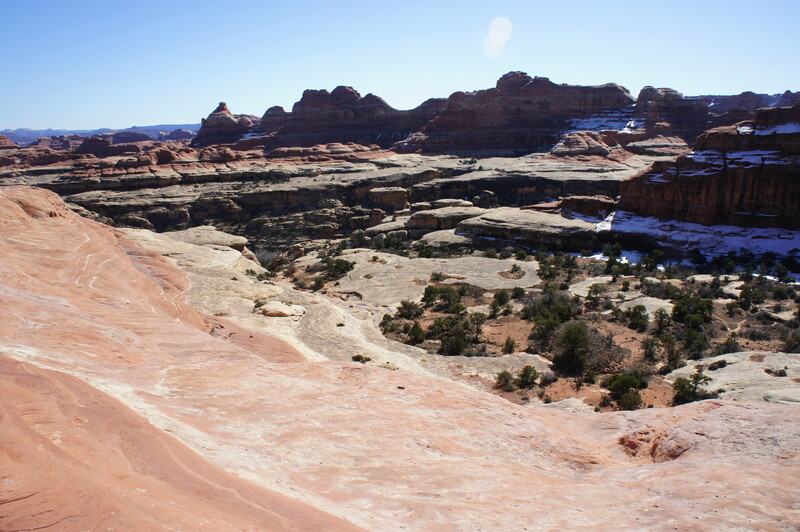 While it was certainly within reason for the trail makers to simply blaze a path around these two ridges, the sandstone fins offer rewarding panoramas—across Squaw Flat to Squaw Butte and the La Sals to the north and east, as well as up Squaw Canyon to the Needles to the south. In the event of recent rains, muddy potholes add to the aesthetic flavor. 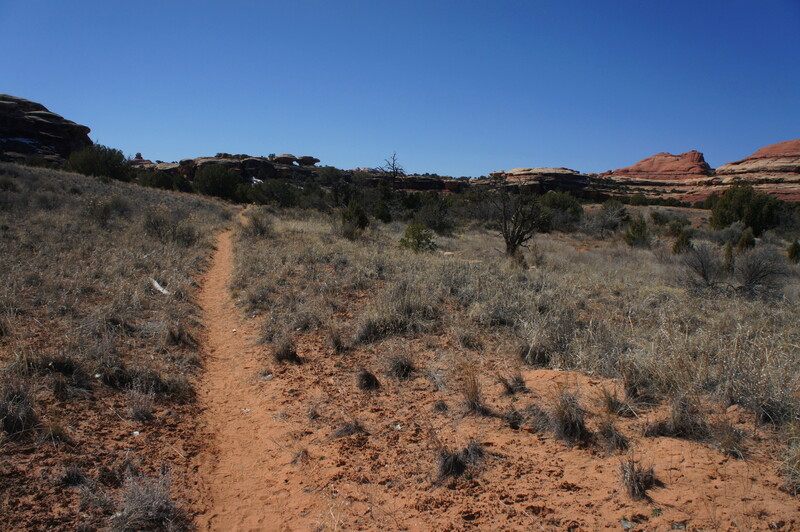 The distance from the second saddle to the opening trail fork is less than 1/3 mile. It is a minute farther back to the trailhead, the terminus of the 7.2-mile loop. Allot 3-5 hours for the loop hike, depending on hiker’s pace. 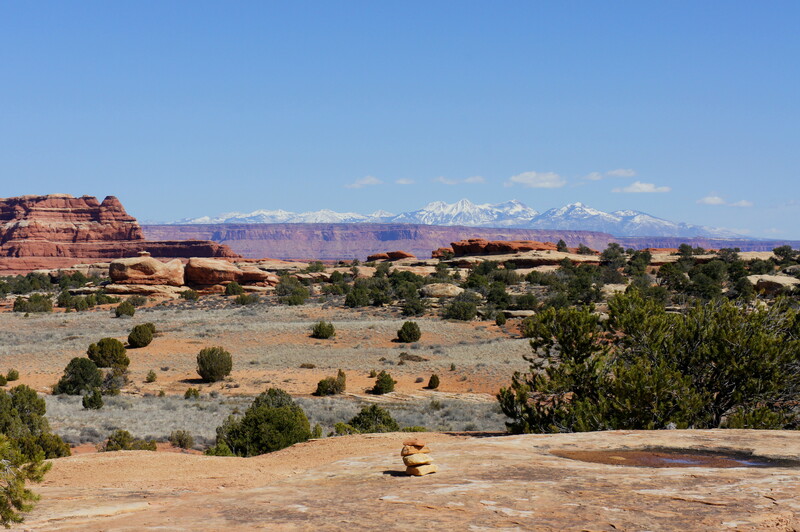 This entry was posted in Canyonlands National Park, Moderate Hikes, Utah and tagged Big Spring Canyon, canyon, Canyonlands, Cedar Mesa sandstone, La Sal Mountains, loop hike, Needles, saddle, Squaw Butte, Squaw Canyon, Squaw Flat, Utah. Bookmark the permalink. Thank you for this great description. I plan on printing this as a guide to our upcoming trip to Canyonlands! Great! Glad it was helpful; have an awesome trip! I only wish I’d seen this description prior to attempting the trail this past September. Went the other way round and only made it as far as the ridge. Weather and common sense dictated turning back at that point. Our family of four just hiked this loop. It was long, diverse and absolutely worth every step. Your description is spot on. Thanks a lot, will visit the Needles in July.